Nano Energy Flask - For those who prefer complete wellness without any supplements!! WATER QUALITY DETERMINED PHYSIOLOGY, AND GOOD WATER QUALITY MAKE YOU HEALTHIER. Quantum Flasks are Stainless Steel Flasks enhanced with Scalar Energy. R & D studies shows that energy from the Quantum Flask is capable of restructuring water molecules into smaller clusters. The smaller clusters of water enhance the bio-availability of water in the body thus promoting the various physiological functions in the body complex. Here is an inexpensive alternative to water purifying systems. The water Alkalizing Energy Cups contains a filter that has a pearl calcium ion and energy stone that releases far infrared rays and negative ions releasing much needed mineral elements into water changing ordinary water into purified nanometer activated water. This will make drinking water alkaline and will assist in keeping balance in your body including enhancing immunity, improving organ health and metabolism. The energy Cup includes a handy carry case so you can take it with you! Water energized by this flask carries subtle energy vibrations that enhance the body’s biofield. This is essential for one’s health and wellness. 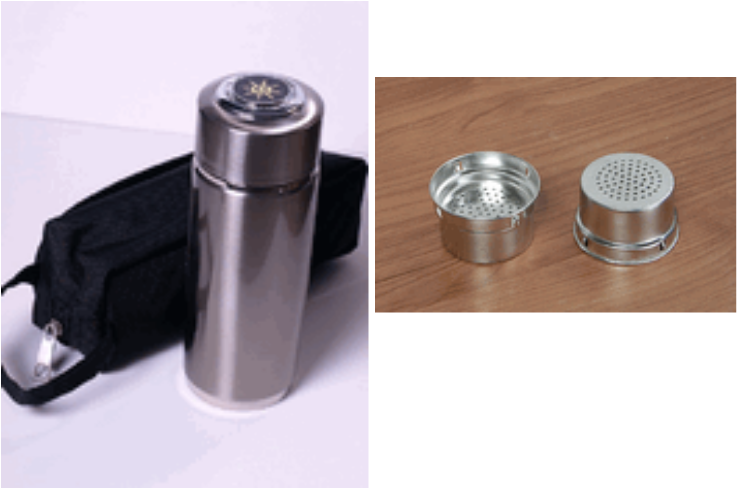 Nano Energy Flask is used to Energizie Water, Juices, Herb Teas, Natural Homeopathic Remedies, Oils, and Creams. The Biomagnets built into this Cup are made from Pearl calcium ion and natural non-Inert material which radiates infrared ray and negative ions in water releasing mineral element such as Ca, Mg, K and Na,changing the common purified water into nanometer activated water. Nano activated water is alkaline in nature and has strong penetrability and solubility with negative potential. The nano breaks down water molecule into the smallest possible size so that they’re more easily absorbed by the body. Negative ions in water, carrying a weak electric current promotes the cell’s self-renewal function, restraining the body’s oxygenation and aging. Drinking Energized water regularly also prevents us from suffering constipation problems, headaches, mouth ulcers, & skin problems. Can improve physiological behaviors, build up your health, and improve the quantity of your life. This product is not a medical device, and is not intended for use in the diagosis of disease or other conditions, or in the cure, mitigation, treatment, or prevention of disease. 1. Alkaline water: Make the drinking water to be alkaline, neutralizes human Bodys acidic substances and keep balance of the body system. Maintain a healthy PH figure and protect liver from the harm that nicotine and alcohol might do. 3. Add beneficial micro elements: Various natural mineral substances are set Out which provide body with necessary microelements and improve every organs to Grow healthy. 4. Energizes water with small molecular clusters structure: With strong Osmosis, diffusibility and oxygen-affinity, the energized water bringing Nutrient and more oxygen is easily absorbed into the body cells, and easily Takes the waste and toxins from our body cells. It quite improves metabolism. With our functional cup, you can enjoy healthy energy water wherever and Whenever you are!